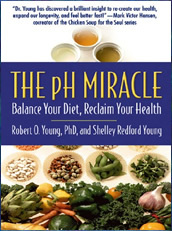 The pH Miracle is written by microbiologist and nutritionist, Robert Young, PhD. It is based on the concept that the pH levels in our blood and tissues significantly affect our health and when our body is too acidic this can cause fatigue, weight gain, low immunity, parasites, Candida and general poor health. We can overcome these health problems by adjusting the pH level of the fluids in our body through consuming a diet with a high amount of alkaline foods and following the principles of a healthy lifestyle. The pH Miracle Diet contains guidelines for transitioning to an alkaline diet as well as a complete program for lifelong health maintenance. To keep your body alkaline your diet must contain at least 70 to 80 percent alkaline foods. For the most part you will be eating a high amount of raw vegetables, juices and sprouts with smaller portions of whole grains, legumes, tofu, fish, nuts and seeds. While fruits are a good food for cleansing the body and they do contain a high amount of antioxidants, they are also high in sugar and have an acidic effect. The only fruits that you should consume on a regular basis include lemon, lime and grapefruit because they are alkalizing. Other foods that should be avoided in the pH Miracle Diet include sugar, refined carbohydrates, dairy products, salt, butter, margarine, meat, eggs, wheat, corn, yeast, mushrooms, vinegar, soy sauce, alcohol and caffeine. Step 1: Transition: For twelve weeks you will gradually switch over to an alkaline diet. Step 2: Cleanse: Follow a green juice fast for one week with nutritional supplements and mild natural laxatives. It is preferable that you prepare your own juices but if you don’t own a juicer you can use a concentrated green powder mixed into water. Step 3: Strictly Alkaline: You will eat only alkaline foods for seven weeks with extra supplements including probiotics. You will consume mainly high-water content vegetables, especially green ones, and as much as possible your diet will consist of raw food. Step 4: Maintenance: In the final stage of the pH Miracle Diet, you will eat 70 or 80 percent alkaline foods, while adding in 20 percent of other foods including fish, grains, soy and starchy vegetables. Vegetables, wheatgrass, soybeans, lentils, amaranth, quinoa, spelt, buckwheat noodles, tofu, almonds, chia seeds, salmon, trout, avocado, flax seed oil, hemp seed oil, herbs and spices, lemon, lime, grapefruit, Bragg liquid aminos. Dr. Robert Young says that the pH Miracle Diet can increase athletic performance, building stamina and muscle as well as providing more energy. Exercise is recommended because it helps the body to eliminate excess acids and wastes, however the pH Miracle Diet does not include specific exercise advice. The pH Miracle: Balance Your Diet, Reclaim Your Health retails at $16.99. Provides a detailed plan for gradually transitioning to an alkaline diet. May assist with the management of Candida and parasites. Can help to improve the recovery from a wide range of chronic illnesses. Encourages a very high intake of vegetables. Emphasizes the importance of pure drinking water. Provides information about food combining. The pH Miracle Diet Includes recipes. Very restrictive and dieters must strictly avoid meat, dairy, sweets, alcohol and caffeine. Requires elimination of many foods that are commonly regarded as healthy including fruit. The cleanse week may result in uncomfortable detox symptoms such as headaches and fatigue. Will require a fair amount of time preparing meals. Very difficult to eat out and stick with the pH Diet. Involves the use of a variety of nutritional supplements. Dr. Young was arrested for making false health claims. The pH Miracle Diet is based on the concept that we can improve our health and lose weight by maintaining a balanced pH and consuming more alkaline foods. This program is very restrictive regarding the permitted foods, however it may be of benefit for those with chronic health problems, such as parasites, Candida, fatigue and low immunity that have failed to respond to conventional treatment. Young, R. O., & Young, S. R. (2008). The pH Miracle: Balance your Diet, reclaim your health. Hachette UK.